Just a century ago, while specialized practices such as farming, preserving food, hunting, gathering, and distilling ensured survival in the unforgiving mountain environment, most Melungeons could neither read nor write and refused to see those skills as part of a cultural imperative. Required to pay property taxes and render military service, they were denied education, suffrage, and free access to the courts. In the late 1890s, visionary Melungeon leader Batey Collins invited Presbyterian home missionaries to settle in Vardy, a Tennessee Melungeon community, where they established a church and built a school of unparalleled excellence. Educator-ministers Mary Rankin and Chester Leonard creatively reified the theories of theologian Walter Rauschenbusch and educational-theorists John Dewey and Maria Montessori. However, despite the missionaries’ heroic efforts, school literacy did not neutralize difference. In the twenty-first century, taking reading and writing for granted, Melungeon descendants are exploring their ethnic identity by creating websites and participating in listserv discussions. These online expressions, which provide texts for rhetorical, semiotic, and sociolinguistic analysis, illustrate not solidarity within the Melungeon community but fragmentation on issues of origins and legitimacy. Armed with literacies of difference stemming from both their natures and their social situations, Melungeons are using literacy practices to embrace the difference they cannot escape. 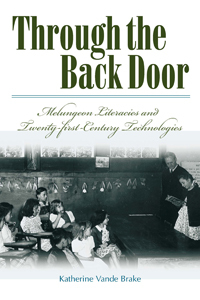 Through the Back Door is the tenth book in the Melungeon Series.